George Brookshaw published the large spectacularly illustrated book entitled Pomona Britannica or A Collection of the Most Esteemed Fruits... in London between 1808-12. The volume with its color printed and hand-colored aquatinted plates is considered to be one of the finest colorplate books ever produced. It shows not only the bounty and breadth of English fruit cultivation but the perfection in printing that could be attained by 19th century British artists and engravers. 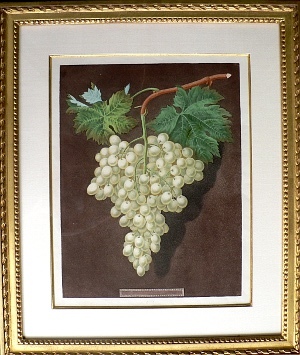 Brookshaw engraved and featured the varieties of fruit that grew around London and in the Royal Gardens at Hampton Court. The plates are remarkably beautiful and arrestingly unusual in their placement of the fruit against dark aquatinted backgrounds. The perfect addition to an upscale wine cellar! Beautiful. 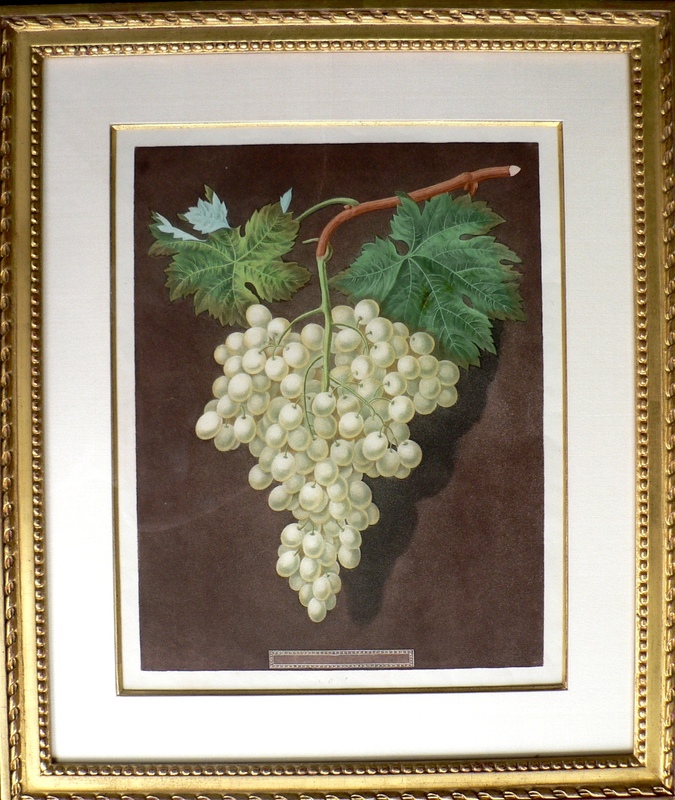 Aquatint with full original hand-color. Full untrimmed margins. Especially clean and crisp impression. Excellent original condition. Framed in beautiful gold leaf moulding with silk duplex mat and gold filet to approximately 25 x 22 inches overall.